The political parties have general agendas, and several high-profile special interest groups particularly on the liberal side have equally high-profile sub-agendas under that umbrella, but oddly, the African-American ethnic group is the only special interest that doesn't have a dedicated political lobby focused only on achieving, sustaining, and protecting their domestic policy issues. The checklist below represents those items the African-American ethnic group needs implemented in order to be fully included in Western society as US citizens, finally freed from the race-based discriminatory practices of the nation's historical legacy. The consequences for not having a dedicated organization ever vigilant over our rights, is that some of the hard won items listed above were effectively repealed or neutralized by our political opponents, and must be reclaimed. Why aren't African-American Democrats fully involved in the political machine, taking advantage of their voting strength, and making the party work for them? Why aren't Black Democrats mimicking the success models of rival Democrat special interests and making sure their concerns are addressed to satisfactory completion by flexing their political and economic muscle within the formal political process, so that they too will receive the grease their squeaky wheel demands? Obviously sitting outside of the formal process -- complaining as we watch the individualistic, lone and impotent Black politicians fail at trying to move policy in directions we need/desire as a special interest group -- has been woefully ineffective and frustrating. Blaming these frustrations on the party itself lacks common sense though. Usually the Black GOP rants that ask us that wrong question are also soliciting for Blacks to abandon ship and join them in the Republican Party, but what will that achieve? The root cause of our perceived problems in the Democratic Party rests solely on the fact that we aren't "telling our political representatives what to do," to paraphrase from President Obama's victory speech. There is a formal process in place to get the political machine to do what you need it to do, one that every special interest group is taking full advantage of except us, but we think the party itself is just supposed to magically do these things for us based on the force of our expressed voter loyalty alone (and presumably our sad, puppy dog eyes). Literally nothing works that way. Not in the adult world. If you want to see the African-American ethnic group finally get their just due in this United States of America that we helped build, then we're going to have to make it happen. Period. The nation is composed of, and run by, the citizens. We are a component of the US citizenry, so what do we look like sitting around complaining because the other components, who have all taken the time to learn how to make the machine work for them, aren't themselves handing us our needs by doing all of our work for us? It looks crazy, and it's embarrassing. so if that's what you are doing on the Blue side of the aisle, what do you think will happen if you lose your minds the rest of the way and actually join the GOP? The issues you complain about now are primarily the fault of you not putting in the work required, not from any particularly inherent hostility from the other Democrats. They very well may be irritated at the fact that you expect your rival Democrat groups to do both their work AND yours though. But you can best believe that the GOP is full of people that absolutely hate you. Whatever the Republican Party USED to be way back during their slave era origins, they certainly aren't like that today. Today, all White Supremacists, neo-Nazis, and other groups actively hostile towards Blacks and their unique interests have all joined the GOP; it is now the party of White Identity Politics. In that party, there is a clear hostility towards you as a Black American if you should dare to go against their diabolical faux "colorblind" agenda and instead support the concept of different ethnic or racial groups in fair competition with Whites. As a member of the GOP, you will be expected to downplay your own unique identity as a special interest group, to support the White Identity Politics of that party's core ideology. The GOP is currently trying to pass laws that neutralize the idea of "racism," rendering it impotent and inadmissible as a legitimate charge against a race-based attack. They are currently pushing to pass various interconnected laws that will eventually lead to the justification for legally returning you to chains as a private prison slave. However unpleasant you imagine the Democratic Party to be to you, the GOP would be the very real version of that nightmare you imagined. We've already spent decades building up party loyalty/identity with our votes as Democrats, so the next logical step is to organize into a sub-party political umbrella group that fights for, organizes, supports and funds the activist cellular groups that are even now dedicated to achieving the ten items listed of this Black Action Agenda. This should be our foundational effort in finally freeing ourselves from the shadows of our country's greatest shame, and achieving the full US citizenship our forefathers prematurely rejoiced over back in 1865. 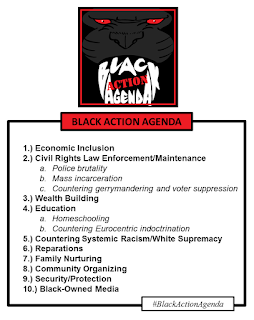 As we begin this work, we have an advantage in that there are already many dedicated and courageous Black organizations, activist groups, and think tanks in place determined to achieve each of the ten checklist items. Besides their pretty much across the board under-funding, and the enormous hurdle of low to zero political support, their other obvious weakness is that they separate, with few pooled areas of support to unite them. Functioning as lonely islands, they struggle to fund drastically needed endeavors, and lack physical security from hostile local government entities. A proper Black Action Agenda would organize them all in a coordinated effort to achieve, sustain and protect the African-American's rightfully earned part of the Pie, leaving behind the long hardships of our disenfranchisement legacy. The secret to Black survival of the worst time period in US history was our ability to come together and support one another. Perhaps it is not coincidence that we were also far more politically savvy as a group as well. Somewhere along the way of the last half century we lost both. It's time to get them back, sooner rather than later. Let's look at a high-level summary of what each checklist item entails. This goal involves unobstructed African-American access to the open markets, access to capital, and the ability to compete equally in industry as a group, as companies, and/or as individuals. The economically included ethnic group is both strong as a unit... self-sustaining in interconnected industries, political bodies, and in businesses, all self-owned and self-directed... as well as a vital, willing contributor into the greater mainstream economy. Its opposite is 'economic exclusion,' and is embodied by deliberate disenfranchisement by powerful monopolies/cartels (in partnership with government), that hoard a society's wealth and power for only one, or a few selfish groups. The fight for Economic Inclusion is no less than the goal of meritorious fairness, and necessarily requires the federal government's commitment to use its force to prevent and/or dissolve unethical collusion, mergers, monopolies and cartels from stifling all markets or opportunities, and actively fighting to keep competition -- the lifeblood of the capitalist system -- open for any who wish to enter them with the spirit of innovation, invention, and growth. This is not an easy fight, since the dominant powers of Western society owe the practice of materialistic hoarding monopoly thanks for all of its successes in the last five centuries. 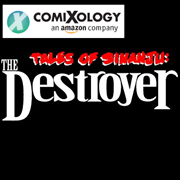 The unprecedented enormous profits generated from the literal enslavement of their competition on the world stage proved so addictive and irresistible, that the desperate desire to return to those conditions accurately describes ALL business and political decisions made ever since the reluctant formal abolishment of slavery. 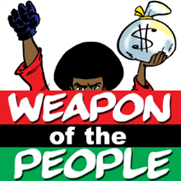 Locking Blacks out of opportunities from the lion's share of the economic table at every level, is a century's old normalized practice of the West's privileged class, and the entire Military Industrial Complex is dedicated to preserving it. The African-American activist soldiers dedicated to achieving Economic Inclusion will require great courage, fortitude and exceptional skill and resource to meet mission. The laws put in place with the various Civil Right Acts, which include anti-discrimination, voting rights, and the right to be recognized as a free person under God's divine law, needed continuous protection by a vigilant former slave, for reasons that should be obvious. The insatiable lust for the massive wealth and fantastically privileged lifestyle provided to the dominant class by the centuries of enslavement and exploitation of Black people should not be underestimated. It absolutely guaranteed immediate efforts to counter the Civil Right Act gains. Fighting to gt the laws passed, celebrating, and then turning your back on the enemy as if he would just let the loss of that wealth go was a grave mistake. As voter suppression tactics have returned to the enemy's tool kit, the activist soldiers fighting to enforce and maintain the existing Civil Rights laws will also find themselves resurrecting and reclaiming many we thought we didn't have to worry about any more. This goal involves indoctrinating every African-American in the ownership of all tools and techniques of building legacy wealth, with the goal of leaving behind poverty forever. From tried & true stock market investment strategies, to land ownership, to entrepreneurship, to the mastering of difficult skills the world will always pay top dollar for, once done it can never be undone. This package of skills will be passed along to every generation as a MINDSET, and a way of life, to be entrenched in the Black American psyche until it becomes synonymous with who we are as a people, and only the professional historian will know that we used to be known for our poverty in the distant past. As both Carter Godwin Woodson and Edward W. Blyden concluded in each of their great works, it did the African-American no good to be brainwashed with Eurocentrism while they were being educated in the Western school systems. Being told that they are inherently an inferior being by the one doing the teaching is an assault, molestation, and as great an evil as it is a lie. From our current hindsight it is easier to see that such "education" served only to condition our people for the various levels of exploitation we were introduced to pretty much from our first meeting, but even if we pretend that the effort really was purely from a good and altruistic place, it still caused incredible damage. Education for Black Americans should involve mastery of the hard sciences (which will not only include mathematics, technology, etc., but also knowledge of law and systems), total knowledge of who they are, and who they are in the global picture. Education for Black Americans should include the Black/Moorish origins of all major concepts (precession of the equinoxes, calculus, etc., etc.,) that the Western mainstream institutions have carefully and fraudulently indoctrinated the masses into believing were originated within White European minds. 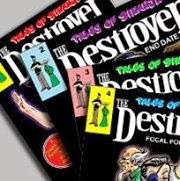 This will be all they will need to tap into that legendary creativity and genius to develop their own literature, their own standards, and bring that juggernaut spirit of competition to create whole new industries, styles, genres and flavors that the entire world will struggle to copy. In order to have that they need freedom... the freedom to explore, the freedom to blaze their own American path without exploitative constraints. This will require the ability to custom curriculum that fit them in every way they need to truly flourish. Centuries of legal, normalized exploitation and oppression of the African-American ethnic group created a lopsided, race-based class hierarchy built into the fabric of the country. All efforts to reverse that racist evil were promptly and aggressively countered by the oppressor class, while official policy was to pretend that the disenfranchised class were winning. Today, legions of GOP-influenced, household name mega-corporations all partner together with influential politicians to ensure the massive wealth from the evil economic systems of old that birthed America continue to keep the money streams flowing. In order to meet this goal, the activists will need to be master strategists, in both the courtroom and the board rooms, and able to make major power moves that beat back the diabolical efforts of the enemy who is actively working to return Black people to chattel in their private for-profit prisons. When people associate the reparatory compensation with slavery alone, it is either from a disingenuous position, or a foolish one. The African-American was oppressed in chattel slavery, domestic terrorism, forced into an anti-Black racial caste system, stripped of their family unity, property, businesses and communities, and preyed upon by for profit prisons and more in a nigh unbroken streak all the way up into the present day. Reparations are without doubt owed for certainly more than just the slavery era horrors. 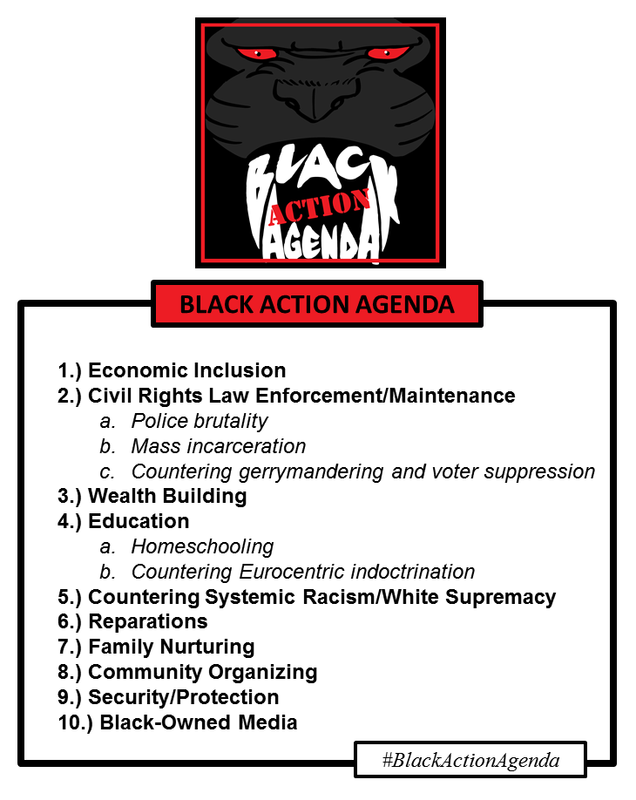 They should pay for the implementation of every single item on this Black Action Agenda checklist for starters. A major share in the wealth generated from slavery, as well as all the anti-Black exploitative systems put in place since, not to mention all the investment wealth generated from the slave money seeded endowments, rightfully belongs to the African-American. A fair reparatory compensation would begin with a complete annihilation of poverty in the Black communities. Using Byron Allen's brave and dynamic example, Black Reparations can only be claimed through an aggressive law suit directed against the federal government (and friends) fueled by righteous anger. From the 'CrossCheck' voter suppression scam, to the documented ill effects of the so-called 'War on Drugs,' to deliberate economic exclusion due to mega-corporate mergers in collusion with political entities, there is PLENTY of evidence readily available to support such a suit. We just need a brave, sharp legal team, our will, and the Lord Almighty to take over when we reach the end of our mortal limitations. The goal is a massive endowment into a Black Reparations foundation fund, one that will pay out a yearly, tax-free grant to all African-Americans, as well as provide 100% free healthcare for each of them and their families. Serious measures must be taken to guard the program from the inevitable "five-dollar Indian" grifter schemes of the usual suspect. Our families are our greatest strength as a community, enabling us to survive, and even thrive, during the worst aspects of our challenging history in America. It shouldn't be much of a surprise that mysterious steps and policies were put in place 50+ years ago, shortly after our last Civil Rights Act victories, that methodically broke our families apart and became our horrifying new normal. The Prison Industrial Complex claims more Black males than were counted as slaves in 1850, and considering mass incarceration generates enormous profits for the usual suspects that enjoyed them centuries ago, its clear that the devastated African-American family is actually a tool, not an outcome. The activists fighting for this goal have the duty of deprogramming our communities, and teaching them to love and sustain the family unit once again, and never let it go. Providing the members of the African-American community the skills and know-how to enable them to pool resources into a strong voice more potent than any single individual is vital towards maximizing every single aspect of their lives. This includes using it as the foundational muscle to get hand-picked Black Action Agenda politicians in effective & strategic government seats, getting local businesses to conform to the communities needs/desires instead of preying upon Blacks in their traditional, post-Integration Era model. Community Organizing when driven by a fully-awakened love of our people, with a firm but patient fortitude of the championship-minded team player, will serve us all as a primary leadership development tool that will keep us winning in every endeavor we set our minds to, especially the most worthy one of total Black Empowerment. The enemy has never been afraid to use extreme violence and domestic terrorism tactics like lynching and torture to keep us subjugated in an exploitative state so that we won't reach our potential and compete directly with him on the national and world stages. The sole secret to his success is the institutionalized materialistic hoarding monopoly of all industries and systems for himself -- keeping the lion's share of all profits for his use alone --and he will do anything to competing ethnic groups who dare try to share in the global wealth that belongs to us all. The numerous race-based massacres that he used to terrorize us, steal our property, and force us into second class citizen status, from the Tulsa Race 'Riots' to the Rosewood Massacre, and hundreds in between and since, prove this is so. It also involved making random examples of individual Blacks to 'season' us with the spirit of fear as part of the subjugation. 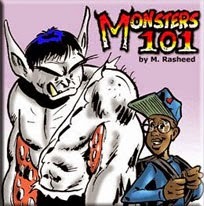 This ninth goal of the Black Action Agenda is all about physical self defense in battle. Our history with our ideological enemy is one of warfare, and we must prepare our minds now for the absolute certainty that success along the Black Action Agenda path of finally taking our lives into our own hands will cause him to pull out the KKK hoods again. 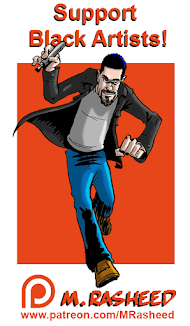 The job of this goal's activists will be as soldiers and master trainers. Every Black man and Black woman needs to start off this Black Action Agenda education as a basically-trained warrior in the most literal sense of the word. We're going to have to fight to defend our honor, dreams, and lives as we work to build up our legacy the way it was always meant to be. You need to fix your mind now on the fact that your enemy hates that idea, and will attack you for it. One of the most efficient tactics of the enemy is to tell you whatever, from his artificial perch of authority, and you will believe him because of the height of his status. Even when you know better, you will eventually start believing him, because you keep hearing his toxic message of White Supremacist brainwashing. No good will come from us receiving all of our information about the world filtered through his lens. The very idea of that is absurd. We need our Black-owned media –controlled by us at literally every single level – as a foundational tool of our own survival. Your dedicated enemy's media is designed to hide the empowering truths you need to be set free from his perpetual subjugation efforts. As an example, note how he was always making fun of President Barack Obama's background as a community organizer, despite how important that tool is in empowering a people? Despite the fact that elite Whites perform the exact same community organizing strategic tools to put together their multi-million dollar 'think tank' networks? They are fully aware of how important that tool is to creating TRUE change, yet the poisonous message from White-owned media is it's something to make fun of, and unworthy of a 'real' President of the United States. Stop listening to him. 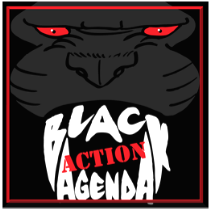 The Black Action Agenda activists on this goal are dedicated to gathering facts, and analyzing them through their fully-awakened African-American eyes, and getting the information to our communities. They do this using the self-owned technology, channels, networks, etc., available, and even work to innovate new ones.